Send mom flowers she’ll absolutely love – in gourmet milk chocolate!! 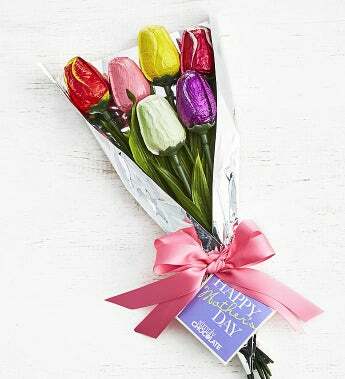 You will make her Mother's Day a day to remember with this delightful bouquet of spring tulips molded in chocolate and foil wrapped in lovely spring colors. Six delicious flowers are wrapped together and beautifully tied with a lovely pink satin ribbon & a Happy Mother's Day gift tag. Gift measures 15.5" x 8.25" x 2.25"